Cheap office space in London – is there even such a thing? It’s a given that coworking, serviced offices and office leasing costs are, on average, more expensive in London than anywhere else in the UK. However, the good news is that there are actually some very affordable places to work in our desirable capital city. To help you find them, we’ve collated a list of the best cheap coworking spaces in London – all of which offer full-time membership for less than £100 (plus VAT) per month. Shocking but true! So, read on or click the links above to find out exactly what you’ll get for your money, and what each of these affordable spaces are all about. Or, if you aren’t in need of a consistent place to work right now, why not get going in a free workspace? Visit our list of the best free workspaces in London here. What will I get for £50 per month? With this membership, you’ll be able to hot desk at the site’s shared business lounge between 9am and 5pm, Monday to Friday. What’s Icon Offices like to work in? The cheapest workspace on this list, Icon Offices’ East London building is a serviced office space. This means that phone lines, utility bills, a receptionist service, and allocated parking are all included in your monthly rent. And if having a speedy internet connection is important to you, you’re in luck. Icon Offices has invested in having its own exclusive fibre optic cable laid beneath the building, meaning upload and download speeds of up to 100mbps are accessible in the space. Icon Offices’ business lounge is bright and airy, with splashes of colour that keep the space contemporary. As well as the lounge, the building is home to 30 private offices and a meeting room that’s free to use. Visit Icon Offices’ website here. What will I get for £65 per month? With The Workary’s most affordable package, known as Flexi, you’ll be able to hot desk at your chosen The Workary facility. NB: Prices vary across The Workary’s locations, and the £65 package isn’t available at every site. What’s The Workary like to work in? With offices located across London, The Workary is founded on a strong sense of community. So, if networking, skill sharing and collaborating is your thing, you’ll find a welcoming, productive home in one of The Workary’s workplaces. Despite its rather small price, The Workary offers plenty of benefits that are designed to help its members grow their businesses. Not to mention discounted access to local meeting rooms and event spaces – and the unlimited tea, coffee, biscuits and cold drinks on offer. Visit The Workary’s website here. As every coworking space is different, finding the right one for you can be difficult. For a helping hand, try filling in the form at the top of this page. You’ll receive tailored quotes from the coworking spaces that are best able to provide what your business needs. What will I get for £84 per month? With Regus’ business lounge package, you’ll get unlimited drop-in access (during business hours) to any of the company’s business lounges across the world. What are Regus’ business lounges like to work in? 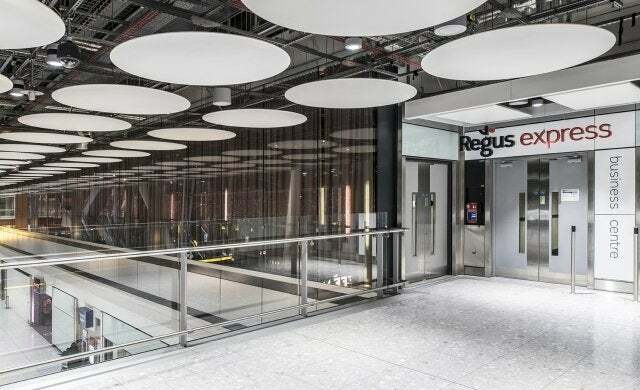 As to be expected from one of the UK’s largest office providers, Regus’ business lounges are sleek, modern and stylish. The spaces are quiet, and feel completely professional. They house printers, scanners and photocopiers for your practical needs, and members are eligible for discounted meeting rooms. But how do they differ from Regus’ coworking and office spaces? Besides the lower price point, business lounges are designed specifically for drop-in hot desking. With convenience at the forefront, you won’t only find them in city centres and business parks, but also in railway stations, airports and service stations. With Regus’ business lounges up and running in over 2,000 locations around the world, fans of exploring different environments will likely get all the variation they need with this membership. What will I get for £95 per month? With this membership, you’ll be able to hot desk at all of Haus’ locations across London. What’s Haus like to work in? If you fancy introducing a touch of glamour to your working day, Haus could be the affordable office space provider you’ve been looking for. A unique model, Haus partners with hotel bars and cafes that would otherwise be empty before the evening rush, and repurposes them as drop-in workspaces during the day. The result is a trio (with more soon to open) of beautifully-decorated, cosy-but-chic coworking spaces in prime London locations. If you’re in need of a meeting room, you can head to Haus’ workspace in W Hotel, Leicester Square. Haus also hosts weekly networking events so you can get to know your coworkers, and has a dedicated mobile app for its members. All of Haus’ workspaces offer free tea, fruity water and snacks, with coffee available to buy. After loads of work and a great launch party, TMRW is officially open and welcoming new members to a growing tech community! What will I get for £99 per month? With this package, you’ll be assigned your own dedicated desk in TMRW Hub’s coworking space. What’s TMRW Hub like to work in? Away from the hustle and bustle of Central London, Croydon’s TMRW Hub has been able to build a large coworking space that’s spacious, modern and very stylish. Importantly, this workspace has been designed specifically for start-ups and established businesses that are building technological innovations. So, if that’s you, you’re in for a range of tech-related events, workshops and resources – and access to a network of like-minded techie peers. In fact, according to TMRW, the entire management team and board come from the tech industry – so they’re well-placed to advise and support you. Unusually, TMRW eschews hot desking in favour of dedicated desks. The provider believes its members should have a secure and consistent space for continued growth. Visit TMRW Hub’s website here. If none of these coworking spaces provide exactly what you need – you might prefer a dedicated desk, for example, or even a private office in a coworking facility – take a look at our guide to the best coworking spaces in London for a range of options for entrepreneurs with a larger budget. If you’d like personalised help in choosing the best coworking space for your needs, simply fill in the form at the top of this page to receive individual quotes from coworking spaces that can provide what you’re looking for. All of the information in this article is correct as of November 2018.